So I know it's a bit late for International Cheeseball day (April 17th), but I introduced my family to the wonders of the cheeseball last night. None of them knew what a cheeseball was, or what to expect. Boy did they get a surprise - of the delicious kind! 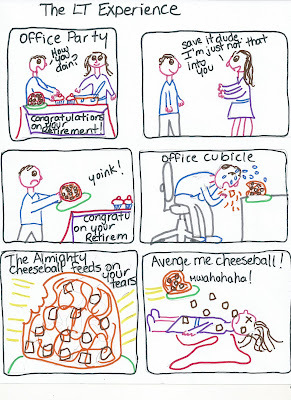 As my whole family was munching on the yummy cheeseball I explained that the cheeseball is a staple of the office party. Hence the name I've given this cheeseball - the Avenge Me Cheeseball. Yeah... I've got too much time on my hands and not enough drawing skills. It's really a Bacon/Ranch cheeseball. - squish the cream cheese into a mash. Add the ranch dressing until the cream cheese become more spreadable. I think I used about 1/3 cup. Mix in grated cheese. Form a ball. Lay the bacon bits out on a plate. Roll the ball in the bacon bits to coat. Wrap and refrigerate for 2 hours. Spread on crackers and enjoy! You are too funny! 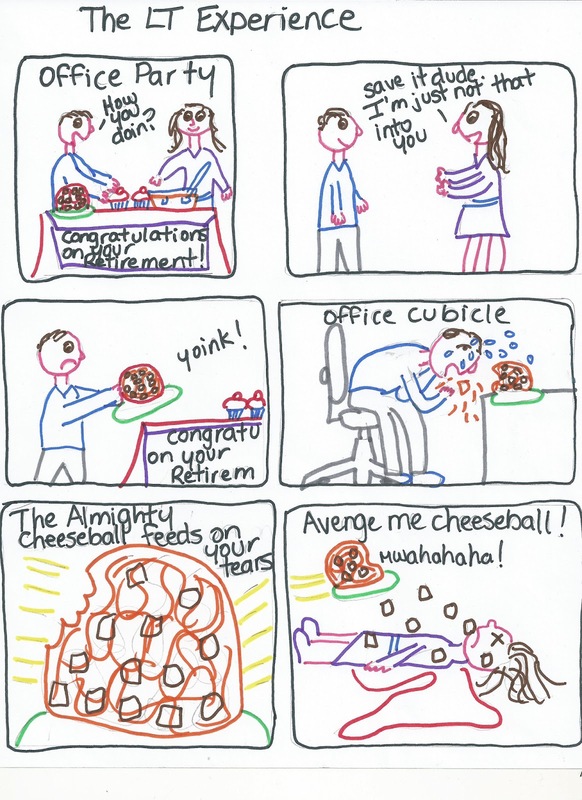 Love your cartoon and that cheeseball looks so good!